From a quick five-minute breakfast for your morning commute to a special seafood feast, I think you'll just love this week's recipes! If you have a farmer's market near you, shop there first for your veggies and eggs. Trust me, farm fresh eggs taste completely different than the store bought variety. As always—enjoy! 1. Heat 2 tsp. of oil in a large pan over medium-high heat. Add the chicken, sprinkle with salt, and saute until cooked through—about 6-8 minutes. Transfer cooked chicken to a plate, and set aside. 2. Add remaining oil to the pan along with minced ginger. Saute for about 30 seconds, and then add coconut milk, broth, red pepper flakes, sugar, and fish sauce. Whisk in the curry paste and peanut butter and bring to a simmer. Add bell peppers and continue simmering for about five minutes. 3. 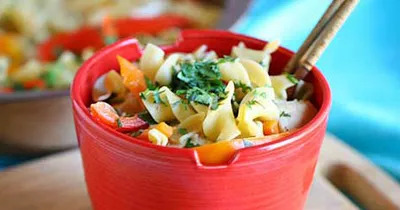 Cook egg noodles in boiling, salted water and drain. Add noodles and chicken to the broth and heat through. Sprinkle cilantro over chicken and noodles. Serve. A quick and easy breakfast-on-the-go idea, just wrap tight and be on your way! oil or butter to fry eggs1. Heat oil or butter over medium-high heat. Add eggs and fry until cooked through (you can either scramble or keep the yolks whole). 2. Heat the tortillas, then layer black beans, fried eggs, salsa, slices of avocado and cilantro in each. Be careful to leave room so you can wrap up your tortilla! 1/4 to 1/2 tsp. sea salt1. Heat olive oil in a large pot over medium heat. Add shallot and garlic and saute for about three minutes, until soft. Add rice and toss to coat each kernel with oil. 2. Add the white wine to the pot and stir. Cook until all the wine has been absorbed—about three minutes. 3. Add the stock, (a quarter cup at a time) stirring after each addition and not adding any more until the previous batch has been completely absorbed. It will take about 45 minutes to complete this step but don’t skip it! It will ensure you completely creamy, restuarant-worthy risotto. 3. Blanch the asparagus in boiling water for two minutes, then drain and run over with cold water. Set aside. 4. After all the stock has been absorbed into the risotto, turn off the heat. In a different, non-stick skillet, heat a teaspoon more oil over medium-high heat, and add the scallops and shrimp. Quickly cook until the shrimp are pink and curled and the scallops are opaque in the center. 5. 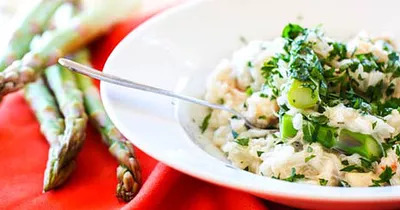 Add the shrimp, scallops, and half a can of lump crab meat to the risotto, along with minced parsley, grated cheese, and sliced asparagus. Season with salt to taste. Serve each bowl of risotto with a big squeeze of lemon over top.